Meats roast succulently in this 35 x 23cm roasting tray with Falk patented 2.5mm bimetal construction. Delicate caramelisation, the optimum flavour enhancement of roasting, is effortlessly achieved in this splendid roasting tray without scorching. Deglazing the pan for sauce and gravy is accomplished with ease due to the satinated surface of the stainless steel interior. 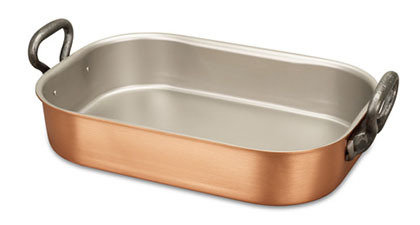 We can't promise you'll be a better cook with our cookware, but we're confident that you'll experience improved results with this outstanding solid copper roasting pan. Sunday lunch with Falk Culinair. Solid! 28 customers found this review helpful. Did you? Yes, I did! My partner and I are slowly building a collection of this cookware as it's really second to none. The quality is incredible. It feels like it will long outlive us both. Considering we have replaced full sets of department store cookware on more than one occasion over the past 8 years, I think it makes sense to spend a bit more on something that's genuinely built to last. The service has been excellent on all occasions buying from Falk. It's nice to feel that you actually matter as a customer and that personal touch is the thing that removes any hesitation from expanding the collection when the bank balance allows. 39 customers found this review helpful. Did you? Yes, I did!